Description: As the name suggests, this is simply the creamiest (read starchiest!) portion of the wheat kernel or grain. The whole grain has a fine layer of bran that coats the inner grain which also contains the germ. This layer and the germ of the wheat grain get separated in milling and the remaining portion known as the endosperm is then ground into a coarse powder that is known as Cream of Wheat (Semolina) Typically served as a breakfast food, cream of wheat seems a reasonably healthy way known to start your morning off right. A hot cereal that is similar to both porridge and oatmeal, cream of wheat is typically prepared with milk and is quick and easy to prepare in the US. 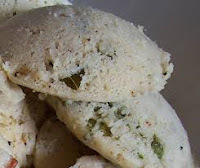 In South India it is known as Rava and ise used to prepare Upma which is a savory version of the porridge made with a variety of vegetables and spices. Also used to make idlis and dosas. Click here for an oatmeal crepe recipe that also used Cream of Wheat. Kitchen Pharmacy: Although it is not a whole grain, Cream of Wheat is very high in numerous vitamins, iron and calcium. It is a great source of energy due to its high amount of carbohydrates and is believed to be beneficial to memory and mental energy.